Personal record cards were used from 1938 to keep track of who lived where. They are part of the population registration. Personal record cards are a great source of information for recent research because they cover the period from 1938 onward. Copies of personal record cards of deceased people can be ordered for a fee from the Central Bureau for genealogy. Personal record cards were introduced in 1938 to replace the old family-based registration. The municipalities kept personal record cards for every inhabitant. If a person moved to another municipality, his index card was forwarded there. It can be thought of as an ‘administrative twin’ that follows you around your entire life. In 1994, the personal record cards were replaced by the municipal basic administration, that registers the same information in digital form. Information about children (full names, dates and places of birth and death. Sometimes not all children are mentioned. If the children had already moved out before 1938 they are often not listed on their parents’ cards). The personal record cards from 1938 onward are not public to protect the privacy of living people. After a person dies, his or her card or record from the municipal basic administration is sent for processing to the Central Bureau of Statistics. When they are done with it, it is sent on to the Central Bureau for Genealogy (CBG). Usually, it takes around two years for the cards to become available at the CBG. Photocopies can be ordered from the CBG for a fee by filling in the application form and sending it to pkpl@cbg.nl. See the CBG webpage (in Dutch) about the current fees. If you don’t know all of this information that’s no problem as long as there is enough the identify the person. If the information is unclear, a research fee will be charged. When ordering more than one card, list the people in alphabetical order. There is no way to order copies of personal index cards of people who are still alive, because of privacy regulations. If the emigrant was born less than 100 years ago, you will need to send a copy of his or her identification and written consent, or proof of death. Otherwise, your request will likely be turned down. My husband and I are visiting Netherlands in Aug this year. We would like to find out if his biological mother’s grave (if there is one). I have a copy of her Personal Record Card which shows date and place of death however no indication if she was buried or cremated. Is there anywhere that we can contact for this type of information? She died 6 April 1956 in Nijmegen. Thank you for any help you can offer. Hi Jo, I just started researching information on my grandparents. They were born in Friesland and Gronigen and moved to the US in the ? 1900’s? I am most likely going to Netherlands in August of this year as well… How much time did it take to get the Personal Record Card..and, was it difficult to get/find? As I already had all the information (birth, death, spouse, children etc) I sent a letter including payment to the Central Bureau in Netherlands. It took approx. 8 weeks to receive a photocopy of the Personal Record Card. In your case it may be an option to actually send the information in and then arranging to pick it up while you are in Netherlands. Most of the Dutch genealogy websites have contract details for the Central Bureau. I have found it a long process especially as I don’t read or speak Dutch. good luck with your search. Luckily, the Archieval.nl in the Ede and Barneveld regions had made these cards accessible and free online. 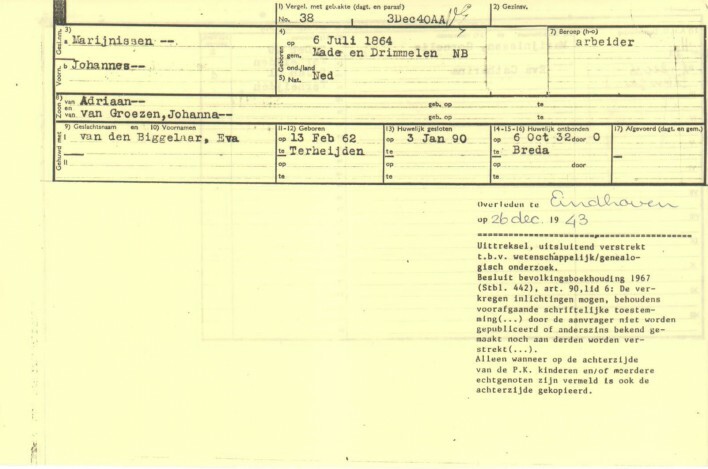 My Tijsseling ancestors were recorded just before they emmigrated to the U.S., so that made the overseas connection so much easier, and readable. I hope they will remain online. The upcoming new privacy law is making many archives rethink their policies about publishing records less than 100 years old. I recommend downloading the cards of your family members just in case. I just tried to apply for persoonskaarten for myself and my mother (we emigrated to Australia in the 1970s). But I got an automated response that the email address you’ve got above is no longer monitored, and they referred me to a broken link on the denhaag.nl website. Any ideas where I can get the cards from now?